This month we are celebrating Collop Monday on the 8th of February. Many of us may be looking forward to pancake day on Tuesday. Some of us may still use its traditional name of Shrove Tuesday, and remember the reason we like to cook and eat pancakes on the last day before Lent starts. Part of preparing for the Lenten fast involved using up the rich food during Shrovetide. Shrove Tuesday’s pancakes use up the eggs, milk and sugar, but Collop Monday was the last day to eat meat before lent, and cooking the collops (traditionally made of bacon) provided the fat for the coming pancake feast. The traditional breakfast on Collop Monday consisted of the bacon-collops and eggs. It turns out this is a great excuse to create a whimsical “Full English Breakfast” themed rolag box! With thanks to our guest makers, Sarah from Setting the Twist who has made this month’s mini skeins, and Kirsty from Buttons Be Good who has made us some beautiful mushroom-themed buttons. “Flesh & Fowl” rolags – inspired by a traditional Collop Monday Breakfast. Knife and Fork stitch markers, made by Imogen. 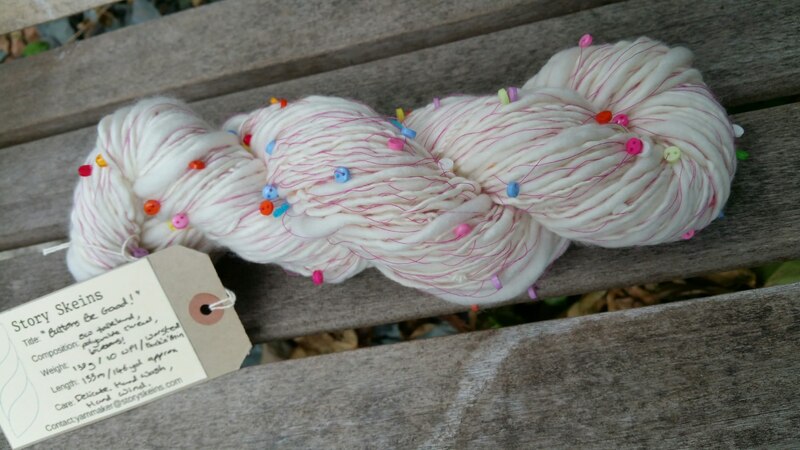 Spun for a friend, Kirsty of Buttons Be Good, this was another experimental art yarn. I had thought for a while that tiny, colourful buttons scattered through a yarn would be fun. I wanted to make the base a slightly thick’n’thin singles yarn and I had some beautiful falkland fibre to work with. This yarn became an experiment in how little I could do to the fibre in the creation of the finished yarn. It is very lightly spun in order to retain its softness, and lightly wrapped in a highlight thread which carries the buttons. 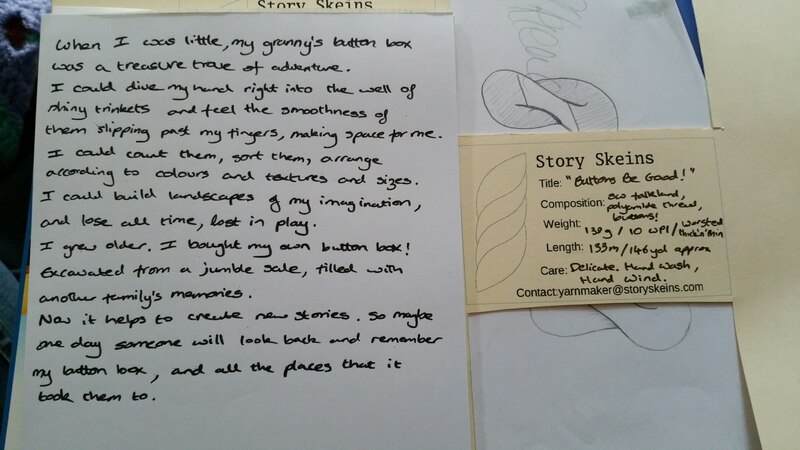 When I was little, my granny’s button box was a treasure trove of adventure. I could dive my hand right into the well of shiny trinkets and feel the smoothness of them slipping past my fingers, making space for me. I could count them, sort them, arrange them according to colours and textures and sizes. I could build landscapes of imagination, and lose all time, lost in play. I grew older. I bought my own button box! Excavated from a jumble sale, filled with another family’s memories. Now it helps to create new stories, so maybe one day someone will look back and remember my button box, and all the places that it took them to. Length: 133m / 146yd approx.